Wisbech Town goalkeeper Paul Bastock was sent off in the FA Vase defeat at the hands of Bromsgrove Sporting. Wisbech Town’s fine run in the FA Vase came to an end today (January 6) as Midlands League high-fliers Bromsgrove Sporting proved too strong at Fenland Park. The visitors won 3-1 in a game which saw high-profile Wisbech goalkeeper Paul Bastock dismissed after picking up two yellow cards and home skipper Jon Fairweather also dismissed after collecting cautions for each of two penalties he conceded. Bastock was sent off for contesting the second penaty decision. Peterborough Northern Star have just been denied a goal against Leicester Nirvana by a fine save. Photo: Chantelle McDonald. @cmcdphotos. Alex Beck scored for Wisbech midway through the second-half to pull the Fenmen back to 2-1, but the second penalty secured a fifth round place for the visitors. To complete a miserable day for Wisbech, they also lost second place in the United Counties Premier Division to Holbeach United who ran out 3-0 winners over struggling St Andrews at Carter’s Park. All the goals arrived in the final 15 minutes of the first half with Lewis Leckie, Danny Brooks and Joe Smith the men on target. Brooks scored with a quality curling strike as Holbeach maintained their unbeaten home record. The Tigers are six points adrift of leaders Newport Pagnell who won 2-1 at Daventy today, but they have three matches in hand. Craig Rook (right) of Peterborough Northern Star in action against Leicester Nirvana. Photo: Chantelle McDonald. @cmcdphotos. 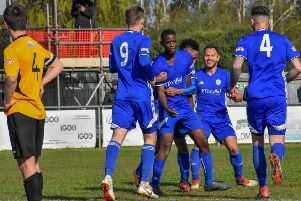 Deeping Rangers are a further five points back, but they kept in touch with a 4-2 success at Wellingborough Town. The hosts grabbed an early lead, but Scott Coupland (2), David Burton-Jones and Jason Kilbride made sure the points went to Deeping who are up to fifth. Leicester Nirvana are a place and a point ahead of Deeping after a battling 3-2 win at Peterborough Northern Star today. The city side started well with James Hill-Seekings smashing home from 25 yards in the third minute, but Nirvana were level within four minutes and eased clear before Zak Munton converted a late penalty after the visitors had been reduced to 10 men. Yaxley’s scheduled fixture at Kirby Muxloe was postponed as was the game of Division One leaders Pinchbeck United at Lutterworth Town who saw their advantage at the top cut to seven points by Raunds. Potton are third after despatching Blackstones 4-1, but Bourne delivered a remarkable finish at home to Bugbrooke St Michaels. It was 0-0 at half-time, 1-0 to Bourne midway through the second-half until the final five minutes when the hosts added four goals to complete a 6-0 romp! Jack Humphries claimed a 22-minute hat-trick, while Robbie Pearce. Gav Cooke and Adam Rothery also scored. Goals for Michael Chow and Jack Brand ensured a second win in three Thurlow Nunn Division One matches for March Town United who beat Downham Town 2-1 away from home. March are now 14th, five places ahead of Wisbech St Mary who were beaten 3-2 at Cornard United. Fourth Round: Wisbech Town 1 (Beck), Bromsgrove Sporting 3. Premier Division: Holbeach United 3 (Leckie, Brooks, Smith), St Andrews 0; Peterborough Northern Star 2 (Hill-Seekings, Munton), Leicester Nirvana 3; Wellingborough Town 2, Deeping Rangers 4 (Coupland 2, Kilbride, Burton-Jones). Postponed: Kirby Muxloe v Yaxley. Division One: Bourne Town 6 (Humphries 3, Pearce, Rothery, Cooke), Bugbrooke St Michaels 0; Potton United 4, Blackstones 1. Postponed: Buckingham Town v Huntingdon Town, Lutterworth Town v Pinchbeck United. Division One: Cornard United 3, Wisbech St Mary 2; Downham Town 1, March Town United 2 (Chow, Brand).